Fall is my favorite time of the year. Crisp weather, all the color, relief from the summer, the coming of the holiday season. One of my favorite images is the candy corn. I used to love them, and had rules that they couldn’t be purchased or eaten until October 1. It’s never even remotely cool here until about that time of the year anyway, and celebrating in 90F heat seemed just wrong before then. 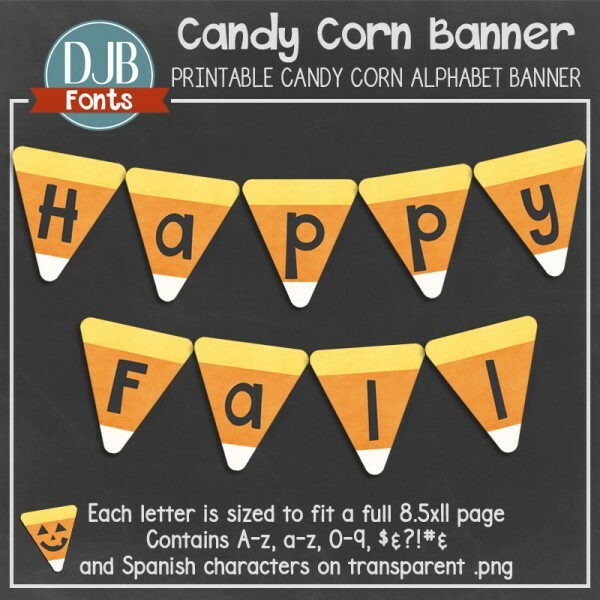 The candy corn is just such a fun shape and color and I wanted to do something to incorporate it into our fall decor this year. I bet it will look fantastic in yours, whether it is in your classroom or your home. So here is a customizable, printable banner so that you can make a banner for your home with whatever phrase you’d like. It’s 7″x 7.8″ and prints a single letter per page. Print out each letter you need for your banner. I suggest cardstock to make it more durable. Laminate. At home you may not need to, but if you’re doing this for your classroom and plan on using it again, lamination is a good idea. If you’re only going to use it once in an area the kids don’t touch, you can skip that step and save the money. Cut and punch two holes in the top corner. String with twine, rope or ribbon and hang. I would also suggest that you tie a knot at each spot the twine goes behind the card to help create even space across your banner. I’ve included a blank segment if you’d like to use that to make a visual blank space to match. I’d love it if you’d take a photo of your banner and post it in the comments here or email it to me at djbfonts at gmail dot com. I bet it looks unbelievable cute! 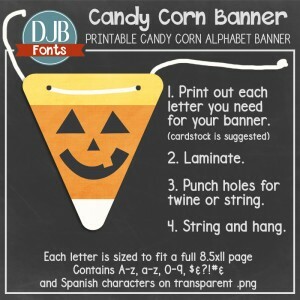 You can purchase the banner at Teachers Pay Teachers or Etsy. Do you like candy corn? Have you ever tried to make your own?